It might not feel like spring just yet but—believe it or not—warm days are just around the corner. That means impromptu afternoon picnics, rooftop cocktails at sunset, walking to work with the best song ever blasting into your earphones, and all of the other post-hibernation rituals that make the season so much darn fun. Want it to be that moment, like, now? We have a solve for making these last few weeks of winter fly on by: a complete wardrobe overhaul. Donate, repair, and recycle your unloved clothes, fold and organize everything you own, then add some fun, sunshine-friendly statement pieces to your closet to make all of your favorite items feel brand new again. Here, our shopping list for the season ahead. Collect all ten and you’ll have a killer outfit for every social event on your calendar. Trends come and go but our love of the “come hither” spring dress never fades. Not only does it make getting dressed easy, but it turns heads like nothing else in your closet. This season we’re feeling classic gingham, bold florals, and dresses with ruffles, but that’s not where our offering ends. We’ve got a perfect spring dress for almost every shape and personality this season—just add killer shoes. Whether you’re an A or DD cup, have curves for days or are all straight lines, the bodysuit belongs in your wardrobe this spring. Think of it like your favorite T-shirt, only 10% sexier due to its body-con fit. We have options that skew ‘90s, sporty, and femme. Style your favorite with nothing but bum-hugging jeans for a body confident weekend look. Or wear it under a wide-leg, high-rise pant for more conservative occasions like bridal brunch or business meeting. Right now we love the idea of wearing your fiercest office clothes in shades of white instead of the typical black and navy blue. The effect is powerful and modern without straying too far from the standard 9-to-5 dress code. Try a white trouser, statement button-down shirt, or mid-heel pump to instantly freshen up your look. We’re also obsessed with our faux-leather pencil skirt, which comes in a eye-catching soft ivory. 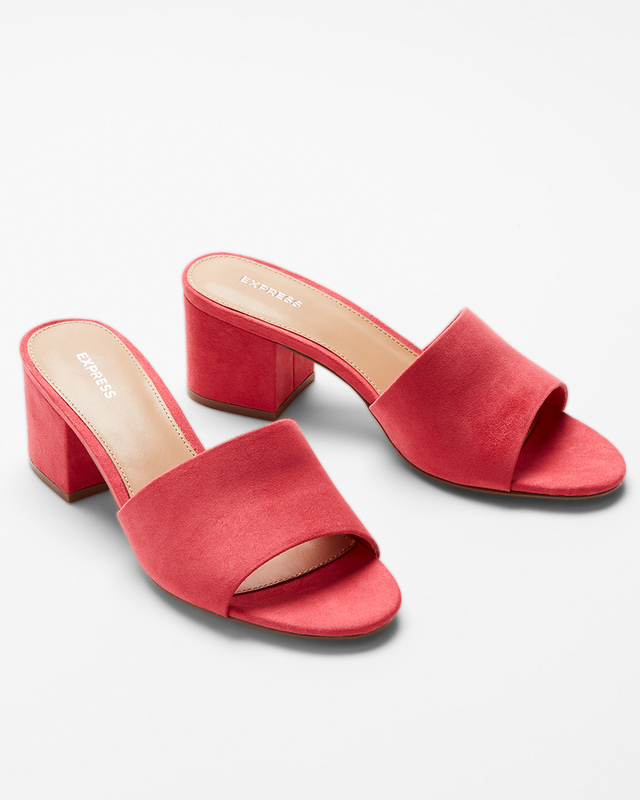 It’s hard to pinpoint just one great shoe for the Spring 2018 season, since we’re living in the Golden Age of footwear right now (hel-lo sneakers), but if you don’t yet own a pair of low heel mule slides, this is definitely the season to do it. Whether for work or play, they upgrade every outfit in your closet, and all without giving you sore arches at the end of the day. Get a neutral or buff pedicure so you can wear all seven colors in our lineup interchangeably. Last year it was all about the off-the-shoulder top, and while a bare shoulder will never be a bad look, we’ve moved onto a different variety of statement top for 2018: the puff shoulder top. Whether the sleeves are subtly tucked or more voluminous, the detail adds a cool, ‘80s-inspired finish to every outfit. Bonus points if you double down by wearing our next must-have at the same time in order to draw the eye right to the shoulders. Sorry dainty jewelry fans, but this spring it’s all about the big, bad statement earring. Think: cheek grazing, cling-clanging, capital E earrings. 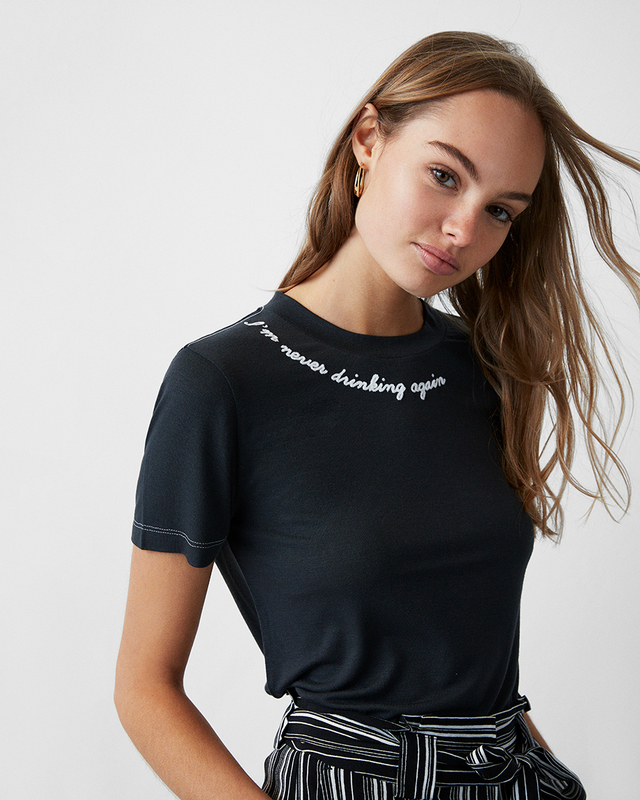 Wear them with nothing but a slicked back braid and a simple T-shirt for a sophisticated ‘90s look or go full Material Girl with big hair, big shoulders, and a strong, penciled in eyebrow. Our favorite thing about this must have? It’s practically the price of a green juice! Is a yellow double breasted blazer the cornerstone of your office wardrobe? Nah. But it sure is fun to wear! Especially if your office is uber-casual and jeans are common. Nothing kicks a pair of blue jeans up a notch like a bold-color blazer, some pumps, and hoop earrings. In addition to yellow, we also have red, pink, and blue. Or try a bold-color trouser instead! They’re the secret to wearing your favorite tees to the office. It is never a bad time to shop for new jeans but when spring hits and your collection of floaty tops gets unboxed, having the perfect pair of legs-for-days high-rise jeans at the ready is a wise move. Our Denim Perfect collection was painstakingly designed with strategic pockets and just enough stretch to show off your curves. The only problem is figuring out when to take them off long enough for a wash.
“Never Drinking Again”, “Love Always Wins”, “We Should All Be Feminists”. Yep, your favorite status updates and photo captions are officially fashion in 2018. Wear these bold tees to speak your mind without saying a word, in social media selfies and the real, 3D world. We’ve got designs for every type of content queen, from the whimsical to the political to the dancing-on-tables diva. We’ve even got the perfect T-shirt for your workout routine: “Resting Gym Face”. In 2018, one do-it-all pair of black leggings are not going to cut it. At least not with so many killer alternatives on the market. From embroidered jean leggings to true stretch pants finished with striping, zippers, and cool hardware, these ultra-comfortable pants have gone from basic and boring to statement-making this season. Wear them on spring’s rainy, gray days with a hoodie and sneakers or with little flats and a fitted top for a Parisian-goes-athleisure vibe.